[AUTO](VC/RC):When this unit's attack hits a vanguard, if you have an «Aqua Force» vanguard, if it is the fourth battle of that turn or more, choose one of your opponent's rear-guards, and retire it. What I find interesting about Valeria is on how she can potentially be a mini-Maelstrom. How? Simple really. It's a one-time trick, but when combined with Aqua Breath Dracokid, she practically becomes one. Anyway, enough about combos; we're talking about the individual card. Since Aqua Force was released, I've had people debate on whether to use Valeria or her brother, Algos. Personally, I run 2 of each that way I can get a better grasp on the two. Most of the time, I've always seen myself lean more and more towards Valeria mainly because she becomes much more of a threat while on the field especially with the lack of retiring skills that Aqua Force has (her, Maelstrom and Hydro are the only current ones). With that said, if she does become the 4th attack or higher, then if they can't guard it, then not only do they take a hit of damage, but they also lose a rear-guard. It'll be tricky on if she would be able to hit or not, but that's the point; she's what I like to call a, "Damage Sponge" meaning that she's placed on the field for two reasons: 1.) To pressure cards our of your opponent's hand and 2.) To become a target for attacks that ultimately means less attacks to focus on your Vanguard. In short, don't be surprised if you don't pull off her effect her often; you have to play her more as a pressure card then an aggressive card, but if you use it correctly, then she becomes pretty scary. 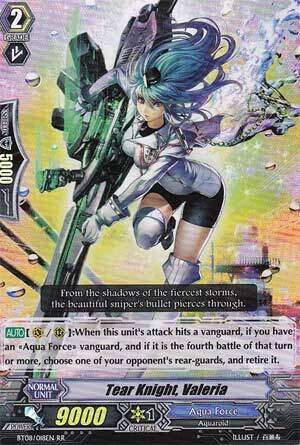 Tear Knight Valeria is one of my favorite Aqua Force units. If her attack hits the vanguard when the number of attacks is four or more that turn, you get to retire one of your opponent’s rear guards for free. Getting to the fourth attack is pretty easy for Aqua Force to pull off, so Valeria should always be a threat. With units like Storm Rider Basil, you can potentially hit four attacks by turn two. Any free retiring is a good thing. In the late game, you’ll probably be attacking with Valeria as the third attack so that your vanguard can have the fourth, so getting her skill off at that point will be more difficult; it will rely on your vanguard drive checking a stand trigger. Hitting that stand, though, will force yet another card from your opponent’s resources. The biggest problem with Valeria is her size. At 9k, she must be supported by a booster to threaten most vanguards at grade 3, or rely on a trigger being drawn. This can take away from her usefulness in the late game, but with stand triggers, her threat will always be there. Rating: 4/5 – Great skill, but needs to be supported to be useful.